Its performance was so good even engaged just the 500MB/day one. The battery can be used for more than 6 hours per day. It's never been so easy to stay connected whilst abroad. 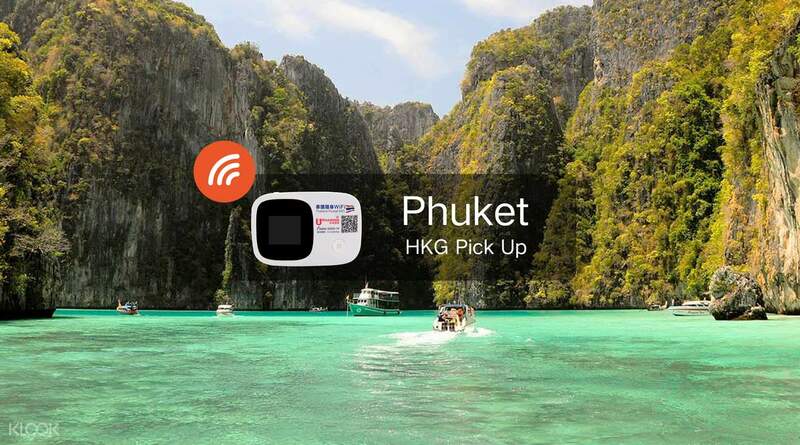 With an easy pick up and drop off service at Hong Kong International Airport you'll enjoy unlimited WiFi access throughout your stay in Thailand, without the stress of sourcing WiFi once you get there. The speedy 4G device connects up to five different phones, laptops and tablets at once and supports 4-6 hours of surfing on one battery charge. So add some spontaneity to your travels with the ability to plan on the go and keep in touch with friends and family wherever you are. Whether you're arriving, or leaving Hong Kong for another destination in Asia, we've got you covered with WiFi pick up at Hong Kong Airport for holidays not only in Thailand but also Singapore, Taiwan, Japan and Korea. it takes forever to find a network in phuket, the battery can last for around 6 hours, the usb cable gets really hot after charging, so be careful when you unplug it. it takes forever to find a network in phuket, the battery can last for around 6 hours, the usb cable gets really hot after charging, so be careful when you unplug it. Worked better than expected was very pleased. Was able to take pictures and upload straight way. Very useful. Worked better than expected was very pleased. Was able to take pictures and upload straight way. Very useful. Great and easy to use. Stayed connected to friends and family during our trip. Was able to share my experiences and didn’t have to wait for wifi area. Recommend pay for deposit with a credit card instead of cash. Only negative is that the device gets quite hot after it’s been on for a while, but that happens with all of them. Great and easy to use. Stayed connected to friends and family during our trip. Was able to share my experiences and didn’t have to wait for wifi area. Recommend pay for deposit with a credit card instead of cash. Only negative is that the device gets quite hot after it’s been on for a while, but that happens with all of them. Did not need to wait long to pick up device at airport. Staff as usual helpful in explaining use of device. Very reliable service throughout the 6-day trip to Phuket including visits to remote islands by boat. Battery able to last till evening so basically additional charging of battery during the day not necessary. Highly recommended. Did not need to wait long to pick up device at airport. Staff as usual helpful in explaining use of device. Very reliable service throughout the 6-day trip to Phuket including visits to remote islands by boat. Battery able to last till evening so basically additional charging of battery during the day not necessary. Highly recommended. good and value added, everything smooth and we feel very user friendly. Easy to pick up and return in airport and will recommend to all of my friend. Certainly we will use again for my next trip soon. good and value added, everything smooth and we feel very user friendly. Easy to pick up and return in airport and will recommend to all of my friend. Certainly we will use again for my next trip soon. My experience with the app is excellent. It has always been a easy app to search and use and the HK airport express product is very good. The service and experience has improved too over the past weeks where it used to be that we need to go to the counter and have the email verified by an airport express staff and sign before we get the ticket. Now with the QR code product it is a lot more convenient and we can skip the queues! My experience with the app is excellent. It has always been a easy app to search and use and the HK airport express product is very good. The service and experience has improved too over the past weeks where it used to be that we need to go to the counter and have the email verified by an airport express staff and sign before we get the ticket. Now with the QR code product it is a lot more convenient and we can skip the queues! First of all, the wifi egg battery life is amazing long. I just charge for 1 overnight and it can work for 3 days. But the size of wifi egg is little bit large and it is a little bit slower than expected. As least we could load google map and whatsapp but if we want to watch Youtube. It is too hard for it. Lastly, the staff in HKG airport is kind and nice. First of all, the wifi egg battery life is amazing long. I just charge for 1 overnight and it can work for 3 days. But the size of wifi egg is little bit large and it is a little bit slower than expected. As least we could load google map and whatsapp but if we want to watch Youtube. It is too hard for it. Lastly, the staff in HKG airport is kind and nice. Unfortunately I didn't get a chance to use my prepaid device as I landed in Shanghai for my layover not Hong Kong. I didn't catch it when booking because my ultimate destination was correct.... Thailand. As I had no internet, I was unable to cancel my reservation and therefore lost out on $24.00. That being said my friends suggested this app specifically for this device and I have heard nothing but wonderful things. One suggestion, please ensure your pick up location is correct when purchasing. Unfortunately I didn't get a chance to use my prepaid device as I landed in Shanghai for my layover not Hong Kong. I didn't catch it when booking because my ultimate destination was correct.... Thailand. As I had no internet, I was unable to cancel my reservation and therefore lost out on $24.00. That being said my friends suggested this app specifically for this device and I have heard nothing but wonderful things. One suggestion, please ensure your pick up location is correct when purchasing. It's really convenient for this portable wifi device to use in Phuket. The connection is nice. But reminded to bring the portable charger with you, otherwise, the wifi device will out of battery quite soon. It's really convenient for this portable wifi device to use in Phuket. The connection is nice. But reminded to bring the portable charger with you, otherwise, the wifi device will out of battery quite soon.